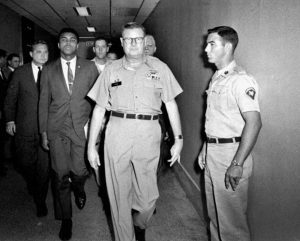 On April 28, 1967, Muhammad Ali made headlines for refusing to be drafted into the U.S. Army claiming exemption status as a conscientious objector. It all happened in Houston at the Armed Forces Examining and Entrance Station and it would set off a chain of events that would not cease until a 1971 Supreme Court decision overturned his conviction. Cassius Marcellus Clay, Jr. was born on January 14, 1942 in Louisville, Kentucky, but changed his name in 1964 to Muhammad Ali after adopting Islam as his faith. In addition to his being a three-time world heavyweight boxing champion, he garnered a gold medal at the 1960 Olympic Games in Rome, Italy. He won his first professional fight on October 29, 1960 with Tunney Husaker, he later defeated Sonny Liston on February 25, 1964 to become the world heavyweight champion. The 1960s proved to be a turbulent decade for the United States due to its involvement in the Vietnam war coupled with domestic unrest caused by the civil rights movement and protests against the war. Because of his Islamic beliefs as a conscientious objector, Ali refused induction into the armed forces and was convicted of draft evasion on June 20, 1967, famously lamenting “I ain’t got no quarrel with those Vietcong.” Muhammad was sentenced to five years in prison, fined $10,000 and banned from boxing for three years. While appealing his conviction, he stayed out of prison and was able to return to boxing on October 26, 1970, winning a bout against Jerry Quarry in Atlanta, Georgia in the third round. The following year on March 8, 1971, Ali lost to Joe Frazier after 15 rounds in what was billed as the “Fight of the Century,” the first loss of his professional boxing career. The U.S. Supreme Court overturned his conviction on June 28, 1971 for his draft refusal.